Are you thinking about taking your next vacation in the sunny and gorgeous Caribbean? Why not combine great food, a fun atmosphere and perfect beaches with the ideal snorkeling experience? Get up close to the Caribbean's local marine life and fully explore the fascinating underwater world. Adventurous travelers are aware that after you are tired of exploring historical sites, and can't stand the idea of visiting another museum, and you've walked through every single open-air market there is, that there is just one thing left for you to do - go underwater. When it comes to exploring underwater, scuba divers do have the greatest amount of freedom. However, is exciting enough even for jaded travelers, and easy enough for kids t do. So whether you would just like to get close to a friendly shark or are exploring an underwater ecosystem with a marine biologist, snorkeling gives you the chance to become fully immersed with nature. The following are some of the best kid-friendly snorkeling areas in the Caribbean that truly amazing. The mile long and one mile wide Little Cayman Island is situated in clear stunning waters which makes for some the Caribbean's finest diving and snorkeling. Surrounded by dive sites, reefs, and wrecks, Little Cayman is family-friend and a great place to visit for people who are serious about marine life watching. Practically untouched, the reefs of the island are full of underwater life. It has marine park status to protect the marine life there. Blood Bay might sound scary, however, it is actually a gorgeous underwater paradise that features Three Fathom Wall, impressive coral cliffs, and creatures such as the odd Lionfish, huge barrel sponges, rope sponges, and the hawksbill turtle. Stingray City, which is in the Caymans and busier, if a family favorite for visiting these amazing creatures. Glover's Reef is situated approximately 30 miles from the coast of Belize and belongs to the Meso-American Barrier Reef. A marine reserve and World Heritage site, it is home to a complete atoll along with a lagoon that is 80-square-miles where plenty of turtles, sharks, and rays can be seen. From March through June you can see the whale sharks. There is a resort on Glover's Atoll to provide the quintessential Robinson Crusoe Experience. Book a thatched cabin situated over the water or camp, to provide you with the fastest route to idea diving or snorkeling, with abundant coconut trees and white sandy pristine beaches at your doorstep. The perfect paradise awaits you! A spectacular and rich marine life can be found in Curacao. Head over to the Curacao Underwater Marine Park running along the southern coastline of Curacao for 12 miles. This family-friendly park features one of the top snorkeling spots in the Caribbean. You will have so many choices of things to see from an incredible array of fish everyplace you look, to coral gardens and sunken ships. Some of the most popular snorkeling sites in flat water on the calmer western side of this island include the beaches of Knip, Playa Abou, Grote Knip, Jeremi, Lagun, Cas Abou, Porto Marie, and Daibooi. Antigua is home to 360 beaches, which is almost one beach for each day in an entire year. The waters here are very impressive. Calm, clear waters are loaded with colorful tropical fish, brain and elk coral, and anemones. For everything ranging from small fish, to whale sharks and tune, take a trip over to Cades Reef or Bird Island where the Caribbean and Atlantic meet. However, be aware of the currents - in certain weather they may be treacherous, so be sure to keep a close watch on your kids. Most of the family-friendly Grenadines islands offer the ideal conditions for snorkeling, whether you are going to Petit St. Vincent and Palm Island, the Canouan and its mile-long reef that is full of vibrant fish and brain coral. The kid-friendly Tobago Cays is another option where you can see eagle rays, nurse sharks, turtles, whips, fans, and soft corals in the beautiful warm, calm waters. Check out Horseshoe Reef, which protects four uninhabited islands out of five that belong to Tobago Cays Marine Park. This protected coral-reef system is full of color and only 12-feet deep. Try the Baradel beach for turtles. This island has a great reputation for being one of the Caribbean's best family-friendly snorkeling areas. With more than 250 species of crustaceans, corals, sponges, and fish, the 840-acre reef system and island are located two miles away from the north shore of St. Croix and is a must see! This is a US National Park that is protected but is still open to snorkelers and divers. Snorkel in between the gorgeous elkhorn coral barrier reefs underneath the brilliant blue waters of Buck Island as you are following colorful parrot fish across an underwater trail that winds through the sunken national treasure. In the park, there are three different sea turtle species that nest there, with abundant brain coral, and threatened least terns and endangered brown pelicans calling the island home as well. For beginning snorkelers, the gentle, shallow waters are perfect. Outside of Australia, the largest barrier reef of 185 miles is located in Belize. There are numerous opportunities here to get up close and see rays, eels, and all types of bright colored fish. Dotting the Caribbean coastline are hundreds of atolls and cayes that are full of colorful coral that is sunk underneath the turquoise waters. Some of the finest options for snorkelers and divers can be found just off Ambergris Caye, which includes Hol Chan Marine Reserve along with shark ray alley which is full of nurse sharks that will gladly allow you to fulfill your fantasy of swimming with sharks. Cayo Diablo is set off the Caribbean and Atlantic and is a 20-minute boat ride away from Fajardo, Puerto Rico. 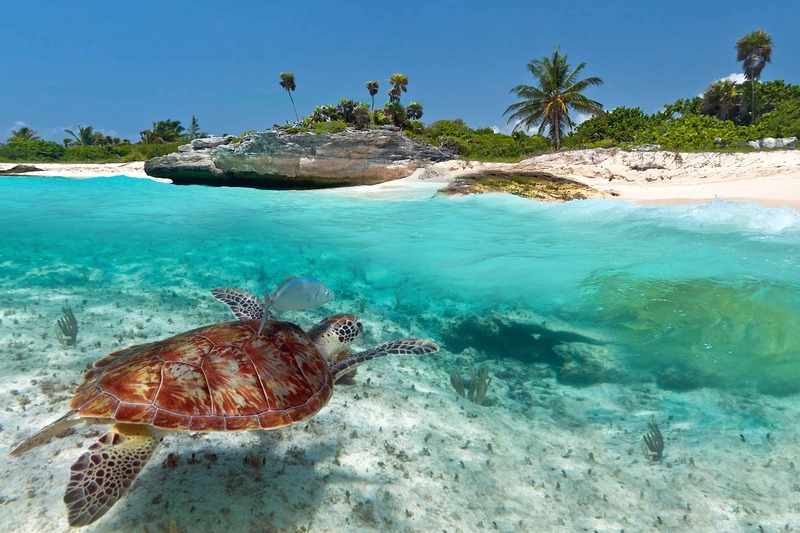 It is renowned for its green and hawksbill turtles that live in the area's shallow waters. These waters are also the home of staghorn and elkhorn corals, in addition to numerous colorful tropical fish. Visit in style at the Waldorf Astoria Resort called El Conquistador Resort. It is located perfectly for exploring both sea and land and is situated between the marine national park, Seven Seas Beach, and El Yunque National Forest. Caribbean Travel & Life Magazine rated this as the No. 1 snorkeling site out of 25 snorkeling sites in the Caribbean. It is one of the finest natural attractions in Dominica. Subterranean geothermal push tiny bubbles up through the ground to give the reef its fancy name. Swim through these bubbles and get up close to sea lobsters, parrotfish, frogfish, and seahorses, along with a paradise o gorgeous Hawksbill turtles and beautiful corals.